Days before the start of Sonia Sotomayor’s confirmation hearings, a new national poll indicates that by a narrow margin, Americans would like the Senate to confirm her as the next Supreme Court justice. The poll also indicates that Americans are split over whether senators are justified in voting against Sotomayor, based solely on her stand on the issues. Americans seem to agree that the confirmation hearings in front of the Senate Judiciary Committee, which begin Monday, could turn into a partisan battle. Six out of 10 said a major fight between Democrats and Republicans will occur, with 38 percent saying that the hearings will be a relatively easy process with bipartisan agreement. The percentage of those who would like to see Sotomayor confirmed in the CNN poll is lower than in other national surveys released in the past few weeks. “One possible reason why the CNN poll shows less support for Sotomayor than other recent polls is a difference in the question wording,” Holland said. 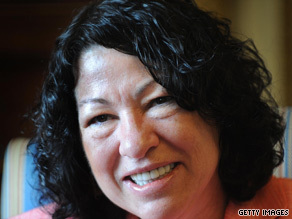 “Polls by other organizations have described Sotomayor as Barack Obama’s choice for the Supreme Court. But in order to make historical comparisons, the CNN poll used a question dating back to 1987 that does not mention the president’s name.” Americans can be swayed by a familiar name, in this case Obama, when questioned about someone who has not been in the public eye, Holland said. “Some of Obama’s popularity may have rubbed off onto Sotomayor in polls conducted by other organizations,” Holland said. “Ultimately, however, Supreme Court nominees rise or fall on their own merits.” The CNN/Opinion Research Corp. survey was conducted from June 26 to 28, with 1,026 adult Americans questioned by telephone. The survey’s sampling error is plus or minus 3 percentage points.